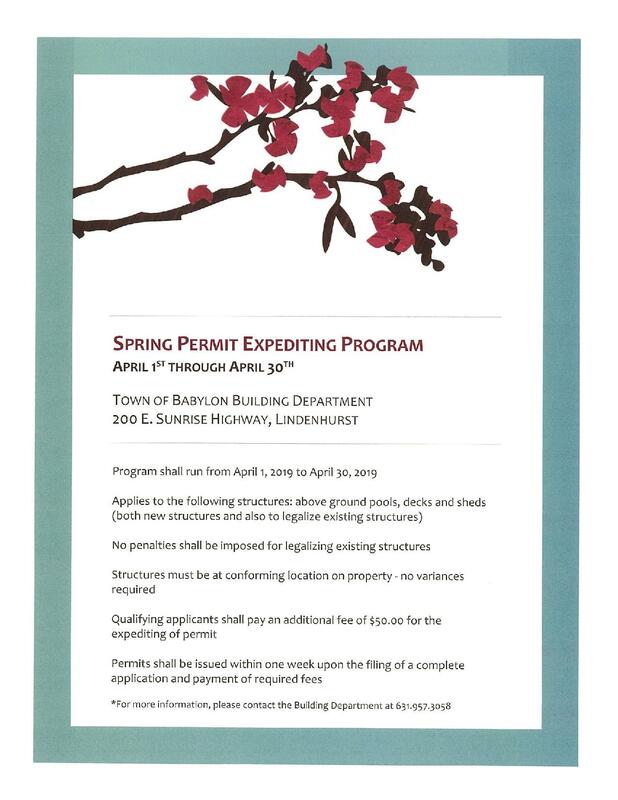 The Town of Babylon Building Department has announced its Spring Permit Expediting Program for both new and existing above-ground pools, decks and sheds. The program guarantees a one-week turnaround time for permits and waives any penalties for legalizing existing structures. “This program is part of our efforts to make the Town of Babylon a ‘one-stop shop,’ ” said Town Supervisor Rich Schaffer. “We want our residents to know that their dealings with us will be quick, convenient and productive. I applaud our Building Department and Planning Commissioner Rachel Scelfo for their efforts with this great program,” he added. Supervisor Schaffer also said that the program is perfect for those who plan to give their property a backyard makeover this spring by adding an above-ground pool, deck or shed. “I hope that our residents take advantage of this great program,” said Planning Commissioner Rachel Scelfo. “We often see folks looking to sell their home that do not realize they need a permit for a previously built structure until the last minute. This program will help alleviate that stress while giving homeowners peace of mind knowing that the structures have been properly reviewed and are safe,” she added. 9:00 A.M. and 4:30 P.M. Permits will be issued within one week of the filing of the application and payment of a $50 expediting fee.